Please join us for a great concert at the National Hispanic Cultural Center, Pimentel Concert Series, Saturday, February 2, 2019 at 7 pm. 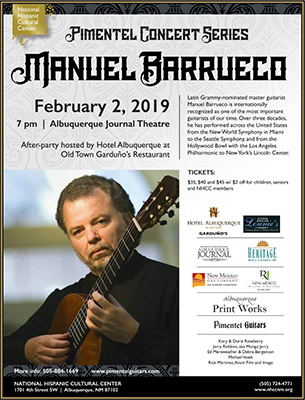 Pimentel concert series Presents Latin Grammy-nominated master guitarist Manuel Barrueco, internationally recognized as one of the most important guitarists of our time. His unique artistry is continually described as that of a superb instrumentalist and an elegant musician, possessed of a seductive sound and uncommon lyrical gifts. Barrueco’s career has been dedicated to bringing the guitar to the main musical centers of the world. Over three decades, he has performed across the United States from the New World Symphony in Miami to the Seattle Symphony, and from the Hollywood Bowl with the Los Angeles Philharmonic to New York‘s Lincoln Center. He has performed with the Philadelphia Orchestra and with the Boston Symphony under the direction of Seiji Ozawa, in the American premiere of Toru Takemitsu‘s To the Edge of Dream, and also appears regularly with the Baltimore Symphony Orchestra and San Francisco Performances. Highlights of Barrueco‘s international tours include the Musikverein in Vienna, Concertgebouw in Amsterdam, Royal Albert Hall in London, Philharmonie in Berlin, Teatro Real in Madrid, and Palau de la Música in Barcelona. He has completed a dozen tours of Japan, and made repeated appearances in Korea, Taiwan, Singapore, China, and Hong Kong. In Latin America and the Caribbean, he has performed in Mexico, Brazil, Colombia, Costa Rica, Panama, and Puerto Rico. Barrueco‘s discography includes over a dozen recordings for the EMI label. The concert will be followed by an after-party at Hotel Albuquerque, Old Town Garduño‘s Restaurant. For our 10th concert in the Pimentel Concert series you are invited to come and enjoy Los Tres Reyes . These great artists came together in 1957, formed by classically trained guitarists and twin brothers Gilberto and Raul Puente, with lead vocalist Bebo Cárdenas. Los Tres Reyes are noted for their contributions in the development of Romantic music in Mexico during the 1950s and 1960s, as well as for their guitar virtuosity. Icons of Mexico‘s popular music, they have recorded numerous albums which have become international hits, touring extensively in the United States, Europe and Latin America. 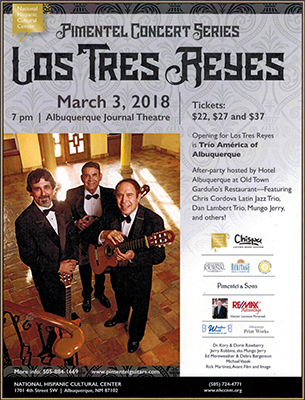 The concert, tenth in the Pimentel Music Series, also features Trío América de Albuquerque , who interpret songs made famous by popular trios from Mexico‘s Golden Age . The concert will be followed by an after-party at Hotel Albuquerque. Pimentel & Sons has received numerous awards including the New Mexico Governor‘s Award, Connecticut Mutual‘s Blue Chip Enterprise Award, the U.S. Leadership Outreach Award, the Innovative Albuquerque Award, and the Pimentel family‘s creations and innovations are displayed in New Mexico museums. 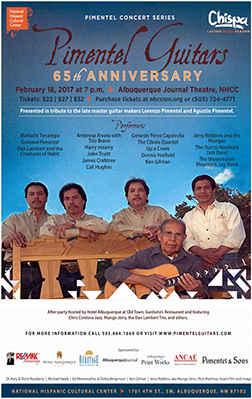 This concert, celebrating the 65th anniversary of Pimentel Guitars and presented in partnership with Pimentel Music, is a tribute to the late master guitar makers Lorenzo Pimentel and Agustin Pimentel. The ninth in the NHCC‘s Pimentel Music Series, it will feature acclaimed guitarists in genres ranging from classical to popular to jazz to folk to flamenco, with a line-up including Mariachi Tenampa, Gustavo Pimentel, Dan Lambert and the Creatures of Habit, Ambrose Rivera with Trio Bravo, Harry Irizarry, John Truitt, James Crabtree, Cali Hughes, Gerardo Pérez Capdevila, the Cibola Quartet, Up a Creek, Dennis Hatfield, Ken Gilman, Jerry Robbins and the Mungos, the Out to Nowhere Jazz Band, and the Watermelon Mountain Jug Band. 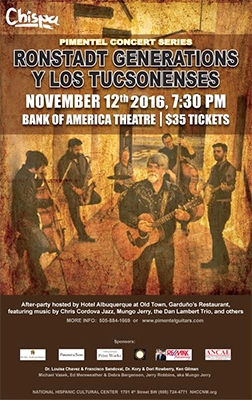 The concert will be followed by an after-party at Garduño‘s Restaurant, Hotel Albuquerque. Founded by Lorenzo Pimentel, Pimentel & Sons Guitar Makers has become known around the world for the custom creation of stringed instruments unparalleled in craftsmanship and beauty. The family has a history of handing down its talents through generation to generation, both through music and guitar-making and through giving back to the community. Pimentel & Sons has received numerous awards including the New Mexico Governor‘s Award, Connecticut Mutual‘s Blue Chip Enterprise Award, the U.S. Leadership Outreach Award, the Innovative Albuquerque Award, and the Pimentel family‘s creations and innovations are displayed in New Mexico museums. Representing five generations in North America, Ronstadt Generations continues the family‘s musical traditions with Michael J. Ronstadt (younger brother of Linda) and his sons, Michael G. and Petie D. Multi-instrumentalists and solo performers in their own right, they present an exciting repertoire that preserves the traditional Southwestern and Mexican songs of their heritage while offering innovative original material. In 2012, three veteran musicians— Alex Flores, Sam Eagon, and Aaron Emery— came on board to form the six-piece ensemble Ronstadt Generations y Los Tucsonenses (the Tucsonians). Playing tenor saxophone, bass, and drums, respectively, Alex, Sam, and Aaron add a colorful dimension to an already powerful presentation that respects tradition while exploring innovation. The ensemble‘s albums include Prelude (2012) and Epilogue (2014). Presented in partnership with Pimentel Music, this is the eighth concert in the Pimentel Music Series. It will be followed by an after-party at Hotel Albuquerque.